Martin Freeman, Benedict Cumberbatch and Amanda Abbington chat to Digital Spy at the BFI Southbank about the hotly-anticipated new series of Sherlock. Dec 16, 2013 · Subscribe to TheShowbiz411! 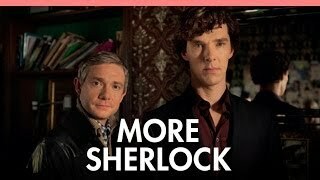 http://goo.gl/SsI4eN Benedict Cumberbatch, Martin Freeman and Amanda Abbington talk ... talk about the new series of Sherlock. bromance, my dear watson. Benedict Cumberbatch and Martin Freeman in Sherlock (2010-).